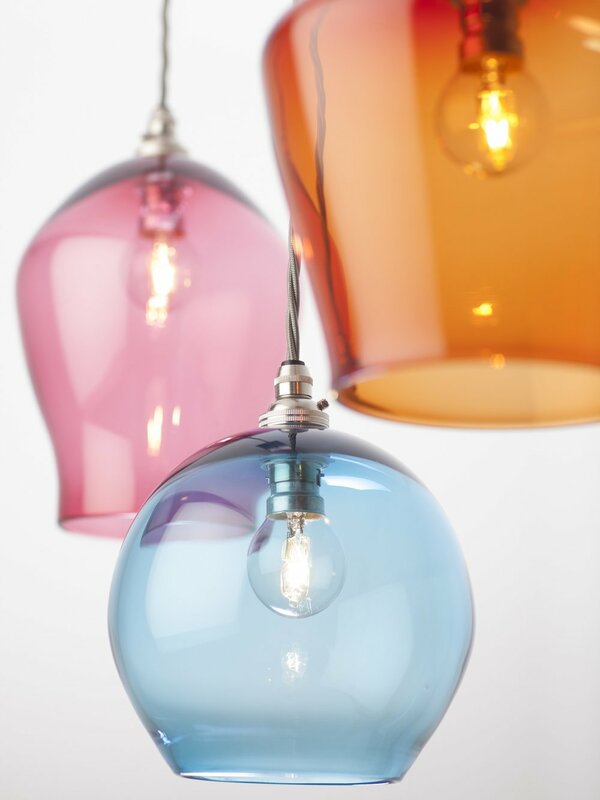 We are pleased to announce the latest addition to our hand-blown glass pendant light range - The Tor Light. This slick new design has been developed by Esther Patterson the designer behind Curiousa & Curiousa and is hand-blown in Derbyshire without moulds, making every piece unique. The Tor Light has a refined look with modern sweeping lines combined with a bold yet natural colour palette. 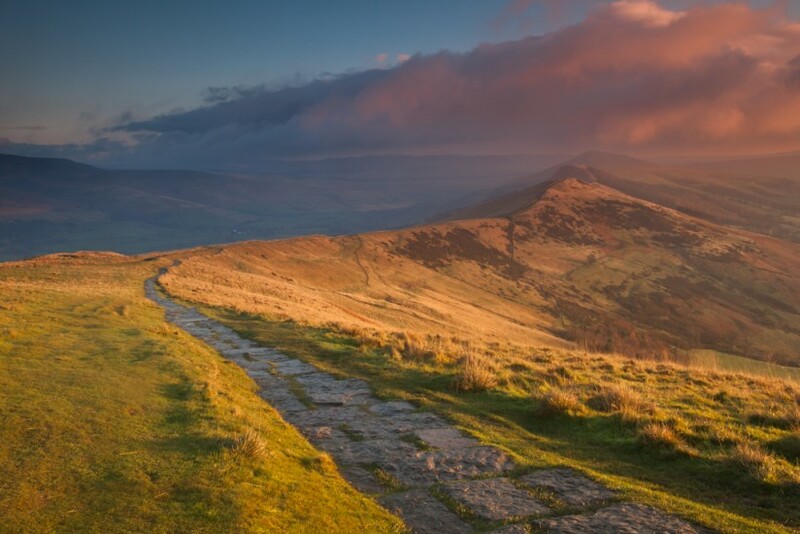 The Tor Light is named after Mam Tor, translated ‘Mother Hill’, which is situated not far from their Derbyshire workshop. The main image shows the select colour palette reflecting the beautiful landscape of this High Peak ridge, combining the grey tones of the limestone mass with the reds and yellows of the local flora in the setting sun, balancing perfectly with its dusky blush interior. This light is available in 23 different colours, pictured here in Slate Grey, Garnet Red and Yellow Ochre. Tor Lights in Yellow Ochre, Slate Grey and Garnet Red. We are delighted English Home magazine have included us in their New Years Honours List. 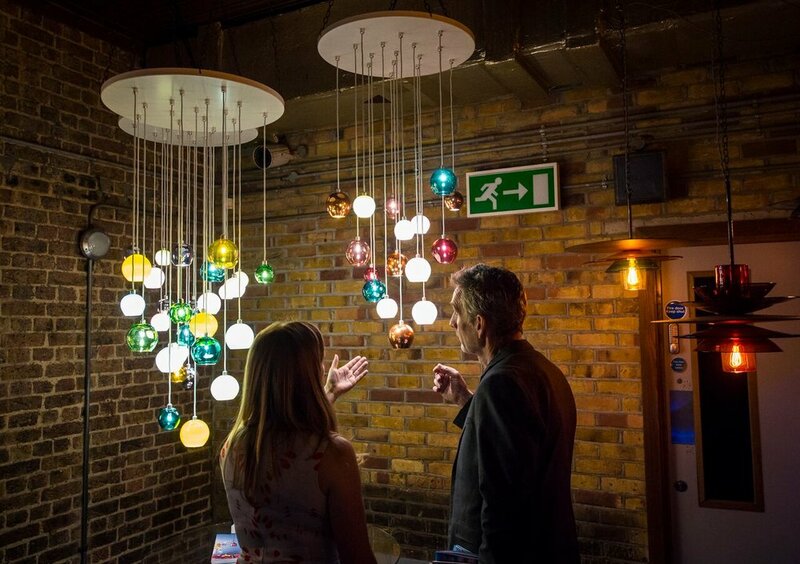 They love our decorative lights for wet areas and the fact that we're pushing the boundaries, using colour in bold and new ways and bringing an adventurous spirit to lighting in bathrooms. We’ve been picked out alongside Tamasine Osher and her beautiful hand carved wooden pendants. Also, Celerie Kemble’s mid-century Parisian and Italian style lights for US based Arteriors. With many designers, their sense of style, imagination and personality continue throughout every area of their lives, and nowhere is this reflected more clearly than in their homes - Esther’s home is a wonderful example of this. This month we were thrilled to have an article in the Guardian’s ‘Observer Interiors’ that featured the Malt House, the home Esther and Paul have lovingly renovated here in Wirksworth. Read the article to see a behind-the-scenes snapshot of Esther’s life outside of Curiousa & Curiousa, and an insight to the style, tastes and principles that her work stems from. Not all of the photographs taken on the day were able to get into the article but we are so pleased with them that we decided to share some of the unseen ones here, including images of Esther and Paul’s other business ‘The Northern Light Cinema’ situated on the ground floor of the Malthouse. Scroll down to see them. A Lotus Dine above the kitchen island. The Ume Lanterns positioned at different heights in the living area. An Acid Cluster and custom Chandelier in the background. A sight yet unseen - here’s a sneak peek of ‘Cocoon’ - a light featuring brass and walnut fittings due to be launched this year. Keep an eye on our social media and newsletter for the official launch. The mural is by Esther and Paul’s son, Gabriel Carr, and the red wire chair is from Bright Potato. Two Tassel Lights and a selection of Table Lamps in the bedroom. 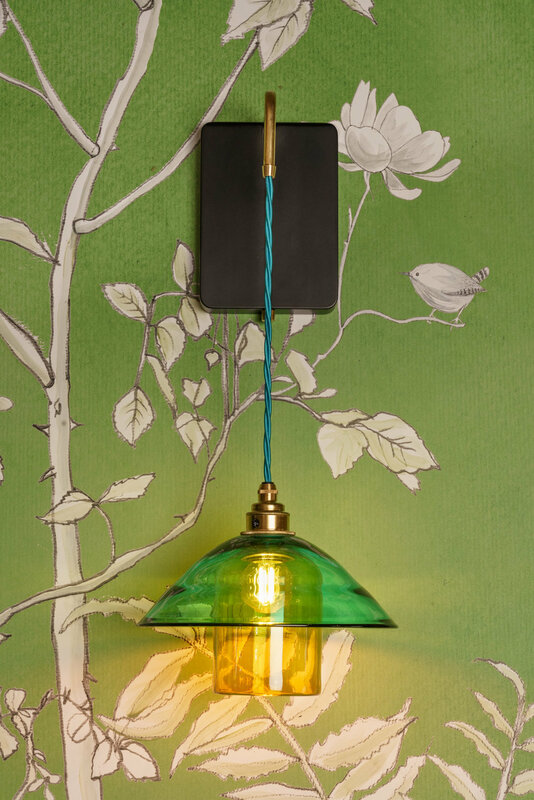 The Japonica Wall Light against Stoney Wood Wallpaper. The fully functioning cinema shows a curated mix of current films, old favourites and even live theatre streams. Find out more about the cinema on the website. Providing great scope for Curiousa style, the cinema’s interior (designed entirely by Esther and Paul) features several lights and chandeliers throughout the bar and auditorium. 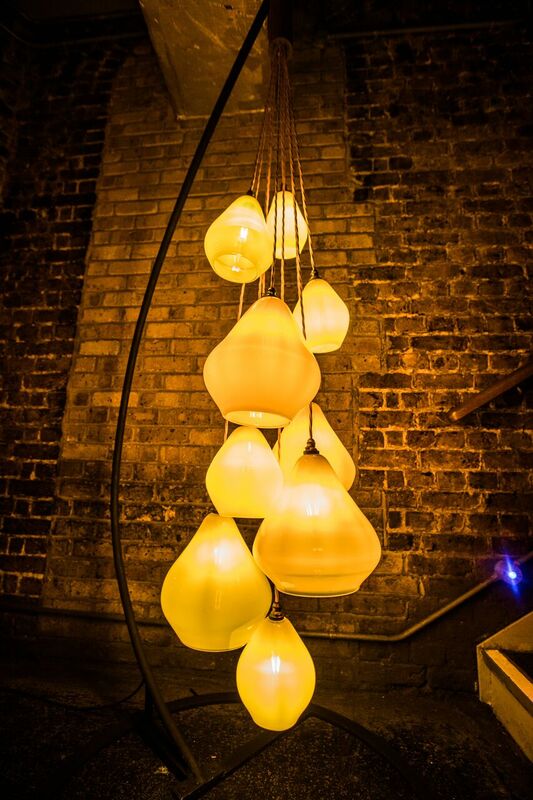 A selection of Acid Drops in varying sizes with a few lights from the Classic Pendant Range over the bar and tables. The Tassel Wall Light keeps up with Ava Gardner’s glamour. (Image by Chris Webb Photography). The auditorium features a few Teardrop Pendants in different colours. Photo by Jez Brough. See more about the cinema on photographer James Balston’s blog here. Click here to read the full article and see a few more images. All photography by James Balston unless stated otherwise. We are excited to announce that 75% of our range can now be made to IP45 standards, meaning they can be used in wet areas such as bathrooms (zones 1 & 2) and outdoor areas. By using an enclosed LED G9 bulb and a non-twisted fabric covered flex, we are now able to offer pendants, wall lights and even chandeliers! 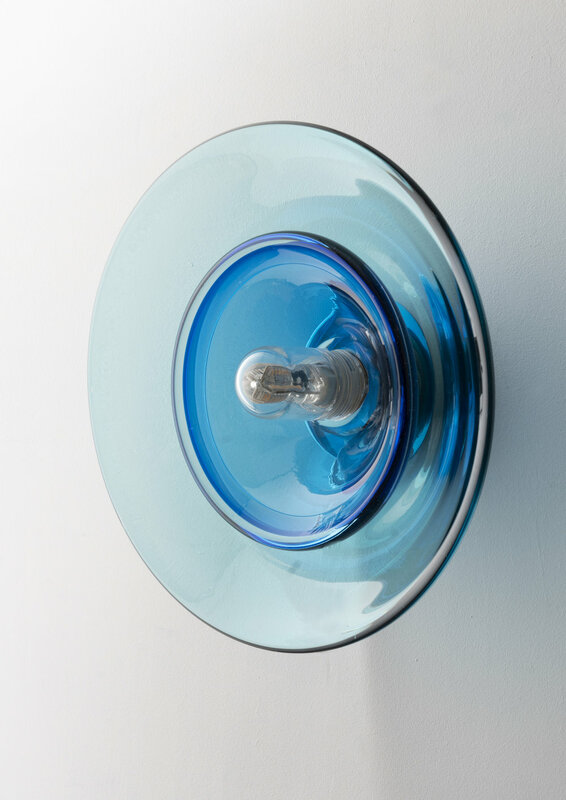 Each wall light is made to order with five fitting finishes and a choice of 23 glass colours. Browse of the full collection of lights and read more here. Designed by Esther Patterson and hand-blown by master glassmaker Fabio Fornasier, our latest light brings the authentic touch of Murano Glass to our collection. 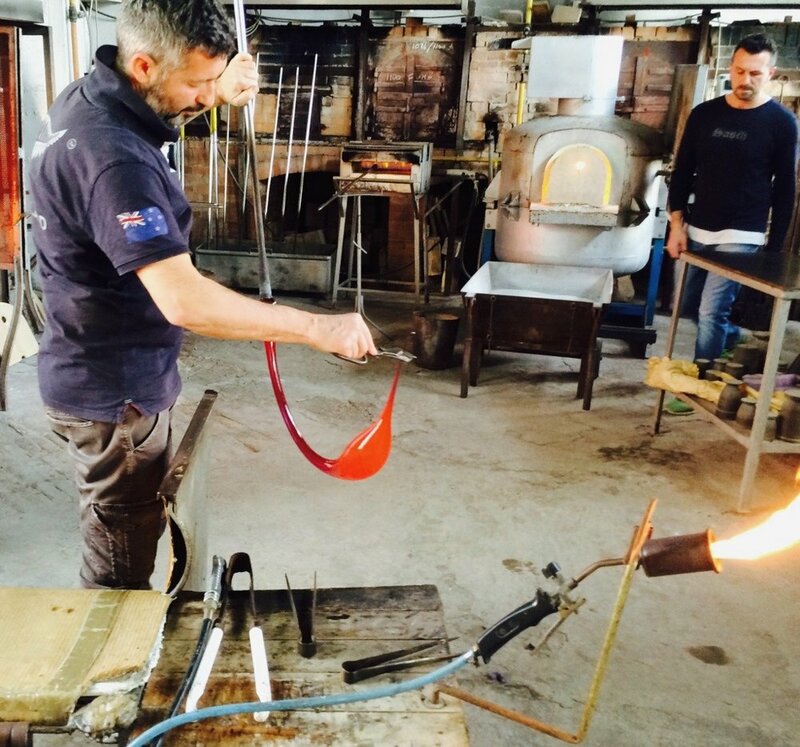 The Venetian Island of Murano has been heralded as the pinnacle of glass blowing craft for centuries, and for the last 20 years, Murano glassmaker Fabio Fornasier has been wowing the glass world with his contemporary take on traditional Murano style. From oil lamp chandeliers to experiments with glass acoustics, he has combined an innovative artistic curiosity with expert craftsmanship. With this in mind, it’s not a surprise that his creations have caught the eye of designers and makers all over the world - one of which is our head designer, Esther Patterson. Fabio is known for large statement pieces, chandeliers comprised of hand-blown glass shapes that appear to be moving and change appearance from wherever they are viewed from. 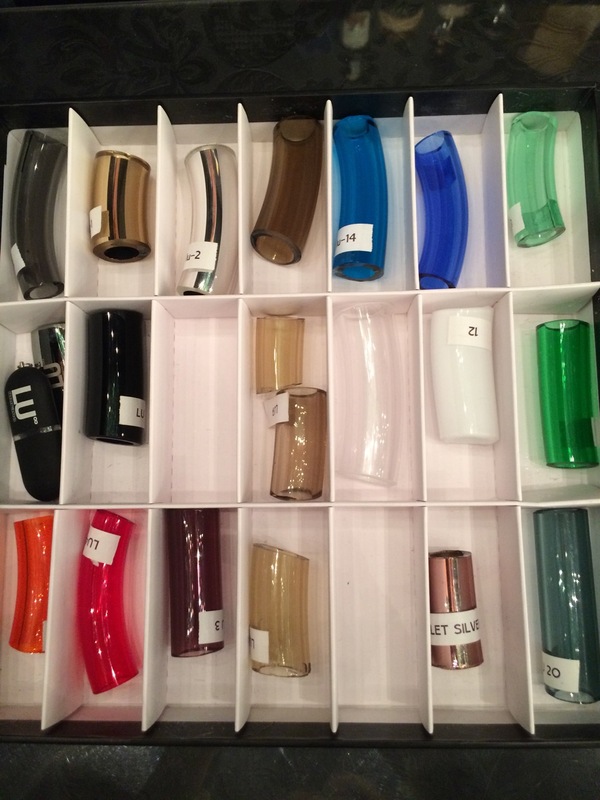 Fascinated by the history of Murano glass and their centuries-old specialist techniques, Esther visited Murano in 2016 and was able to see Fabio create his signature tapering style glass pieces in person. Describing the experience, she said “watching Fabio at work was truly amazing and a privilege - he truly is a master at work.” It was then that she was inspired to work with him, seeing a possibility to “combine the Curiousa simplicity of form with a dash of Fabio’s flare”. The resulting design for the light takes elements of Fabio’s fluid style with his long tapering stems, enhanced further through its luxurious hand-silvered mirror finish. The hand-silvering technique is a Murano specialism, whereby liquid silver nitrate is poured into the cooled glass and creating a luxurious mirror effect. With this light, Esther blends his tapering style with a more linear approach, a style that you can see through her collection in Sculptural Stacks and Stemmed pieces. The piece consists of the hand-silvered Stem, transparent glass Shade and glass ceiling rose known as a Canopy. 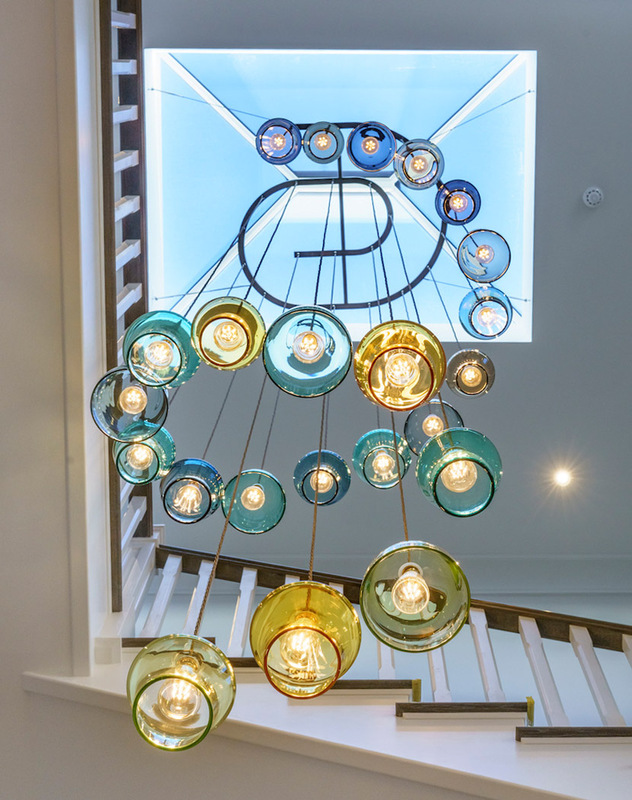 The elegant style gives it a versatility that allows it to be positioned as a single statement light or grouped together as a Multi-Drop Chandelier. Fabio’s mastery with glass as well as the materials available within Murano have enabled Esther to realise this particular creative vision, and we are thrilled to be able to offer this authentic Murano glass piece as a part of our collection. We will be launching the Fabio this year at Decorex International from 16th 19th September, where it will be displayed as an exclusive Six-Drop Chandelier, made by Fabio especially for the launch. Come along and see it in person. View Fabio's website here, and find out the details of this product here. The flower garden and the surrounding countryside that provided a lot of the inspiration for our lights over the last year shine through no clearer than in our latest light, the Ume Lantern. In a slight diversion from our signature glass pendant lights, Esther has embraced a different way of expressing her love of nature with this light, which features floral imagery taken from original paintings, printed onto natural Dupion Silk. As this light is so different, we wanted to show a little of the background and inspiration behind it. Heavily influenced by Oriental style, the use of silk was the obvious choice for the light, not only allowing us to create bigger pieces, but also enabling Esther to bring together the many elements that inspire her work, while harking back to her roots of print and textiles. 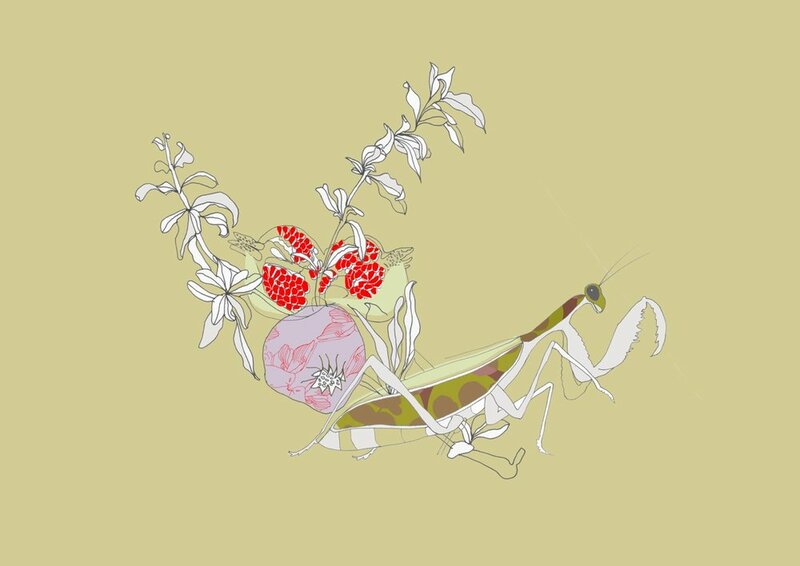 The original design for the print comes from a series of drawings taken from Esther’s own garden in Derbyshire. 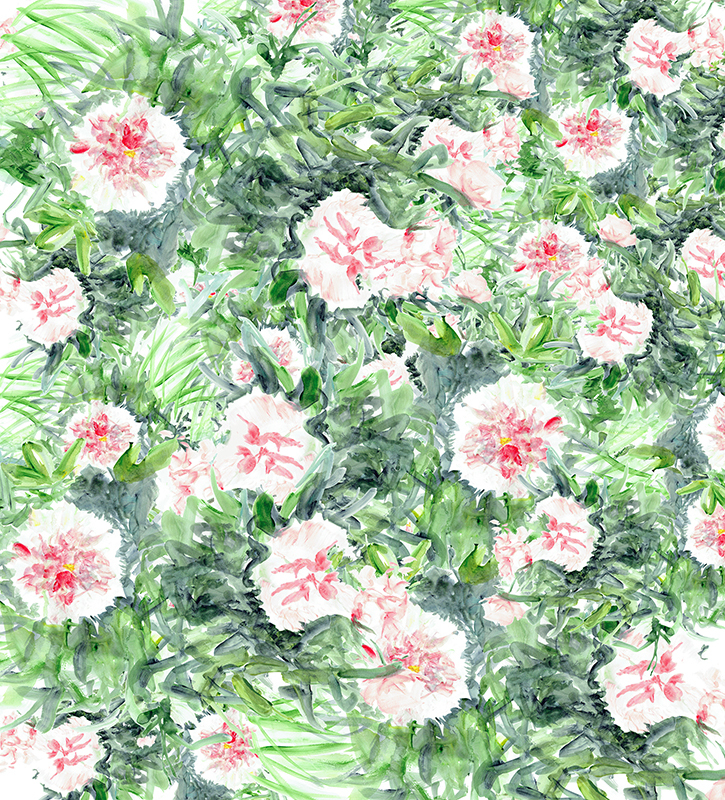 Below are some of the photos and drawings of peonies, irises and grasses that made up the pattern on the design. Although a diversion for Curiousa, the move into print and pattern is a hark back to her roots, as previously to glass lights, Esther started out designing wallpapers and working with pattern and print. 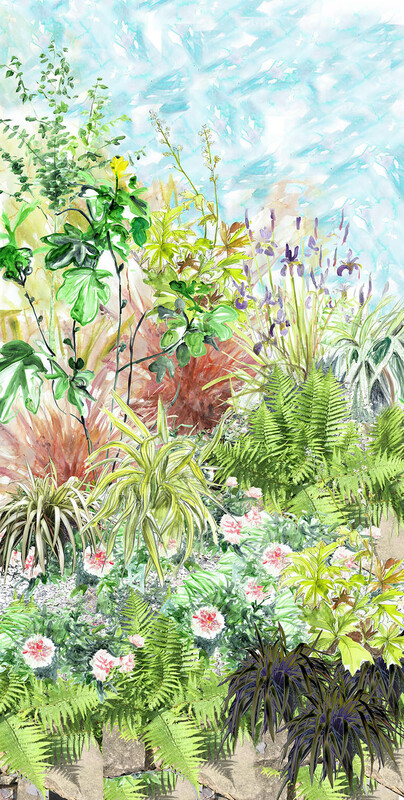 Still very much inspired by print and pattern in her work today, the paintings of plants and flowers have been made into a wallpaper, entitled ‘Garden is Sanctuary’, as well as another design called 'Stoney Wood'. If you've been following our work over the last year, you may recognise the wallpaper from the background of the Japonica and Snowdrop photo shoots! 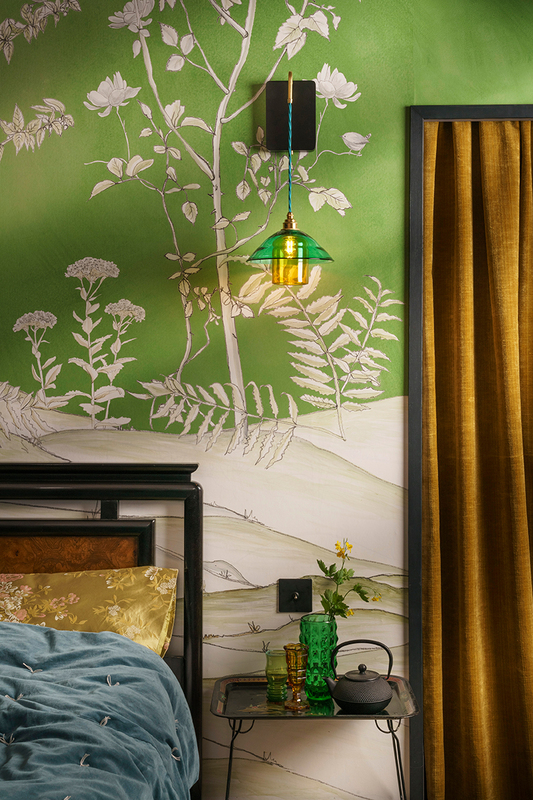 In both designs, you can see strong elements of nature coming through, as well as subtle Oriental influences as seen in the ‘Stoney Wood’ design, inspired by the beautiful chinoiserie wallpaper in Chatsworth House in Derbyshire. 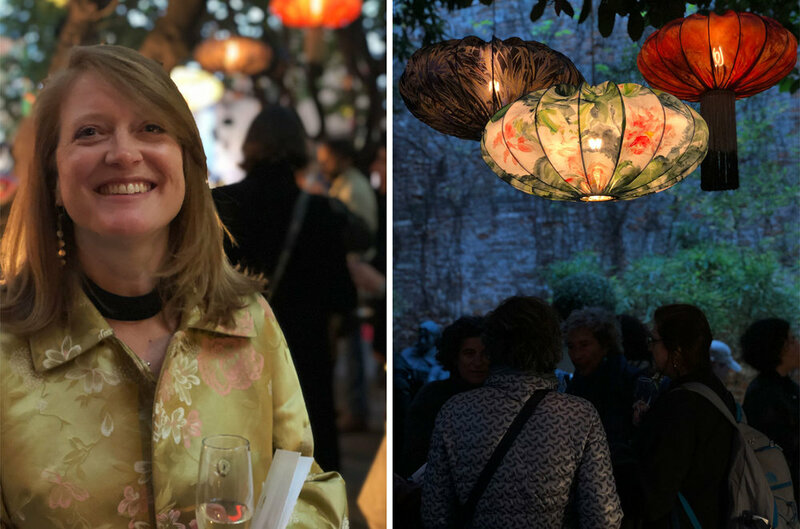 The 'Garden is Sanctuary' design now features on the Ume Lantern printed onto the silk, alongside the 'Stoney Wood' design, 'Red Spike', 'Peony' and other designs options inspired by their colourful elements. The Ume Lantern in shape and style brings together the inspirations of all of these individual elements, whilst being able to make a statement in pattern, colour and size. 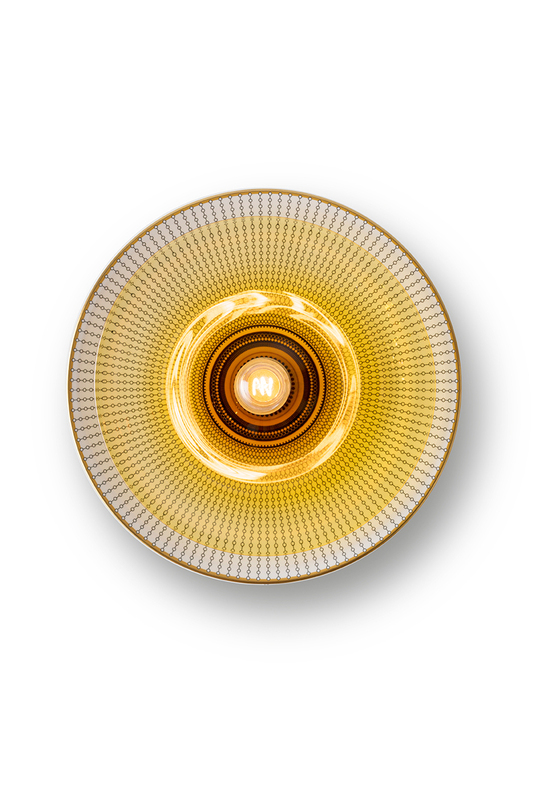 The light will be launched officially at Decorex this year. For Ume Lantern Product Information click here. If you'd like to read more about Esther's story, view the about section. With wildflowers now coming into bloom, colour is the order of the day so what better time to introduce our colourful new light! 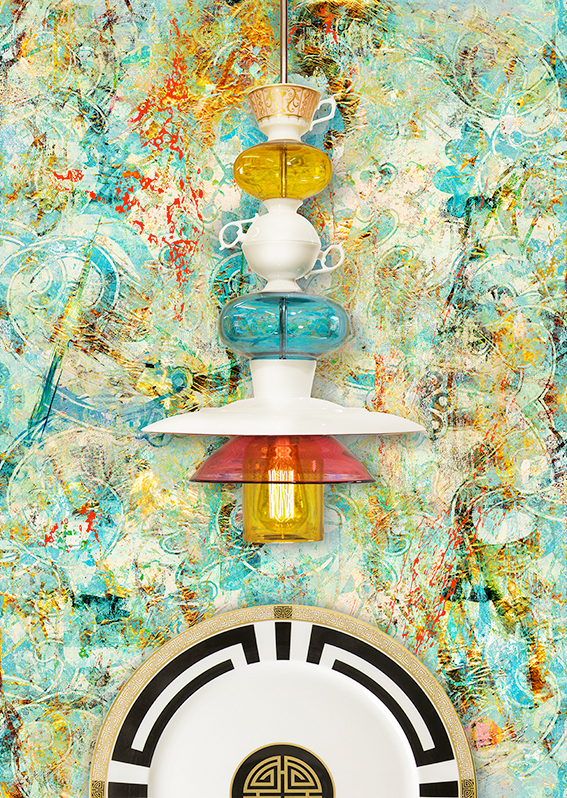 This playful addition is a striking combination of fine bone china tableware and coloured handblown glass in a mix of traditional and contemporary design - a modern twist on a decorative wall plate that reflects the whimsical style that we are known for. Now available to order on our website, click here to read more. In a room where functionality is king, kitchen island lighting is often the place that you can inject a little personality and colour to your design, but with seemingly endless possibilities it can sometimes be tricky to discern exactly how much personality to inject. Perhaps you think installing a chandelier over your kitchen island may be a little too much, but will single pendants be enough? How many? What colours? We understand it can be a little overwhelming, that's why we have put together a few choice examples of kitchen lighting projects we've worked on, to show you what choices were made, and why they worked. Pictured from left to right: Retros in Purple, Extra Large Traditionals in Slate Grey, Large Rounds in Sky Blue. This is possibly the most classic and popular choice for kitchen island lighting, and it's not hard to see why. Three lights provide enough light to create a mood, but without creating too much visual clutter, and the single pendants can provide pops of colour while retaining elegant uniformity - a modest, sophisticated option. Here, the brighter the colour the bolder the statement, so with paler or more neutral colours you can go a lot bigger, like with the Extra Large Slate Grey Traditionals, whereas the Large Rounds look really punchy in Sky Blue set against the off-white colour scheme. In spaces with very high ceilings, it can be good to break the space up a bit with a suspension bar, but that's not the only purpose it serves. Decorative lighting can often be left as an afterthought of the renovation process, leaving you to wonder how you're going to light the five pendant lights that you've fallen in love with, with only one electricity point in your ceiling. With a suspension bar, several pendants can be wired up to one point. The minimal fixtures can be a great solution to a sloped ceiling, and with the different colour and material options it can create a variety of looks, from 'industrial' Brushed Nickel, to sophisticated walnut wood or slick Chrome. If a suspension bar isn't your style, you could opt for a raft as an alternative. In this kitchen, the client opted for five Large Aubergine Bowls to hang over their large kitchen island. Another elegantly uniform choice, and with so many pendants the same colour and size, the risk of looking a bit 'stiff' is avoided by suspending them at varying heights, which also helps to add a bit of dynamism in such a big space. Ask any interior designer and they’ll tell you the key to good kitchen lighting is layering. Although the decorative lights would like to take all the credit for lighting a room, your kitchen lights should be made up of a combination of lighting: task, ambient, and decorative. In this example LED task lights have been positioned between the decorative lights, allowing the decorative lights to create the mood, and the task lights to light the island. Regarding lumens and brightness, there's lots of great advice on the John Cullen website to help you decide how to create your desired level of brightness. Pictured, first image: Triptych Stem, Triptych Dine, Triptych Orb, second image: Triptych Stem, Bubble Light, bespoke Bubble and bespoke Sculptural Stack. In the day and age when kitchens are used for so much more than just cooking, you might consider putting something a bit more dramatic above your kitchen island, such as these trios of sculptural stacks, after all, kitchens are often the most popular room in a party. The first kitchen pictured here is a little special, as not only is it a show kitchen by Martin Moore, but it is also used as the setting for cookery masterclasses with top chefs, and there a bit of pizzazz is very welcome. If you are planning on doing something fabulous in your kitchen, you might want to opt for equally fabulous lighting to match. It all depends how you are planning to use it. As with all lights you need to consider ceiling strength, but the bigger and more dramatic your lights are, the more weight they need to support, making sure the lights are fixed to a wooden joist above the ceiling is essential. If your joists aren't in the right place, you can ask your builder to install one for you. We give one metre of flex as standard, but you can have more or less - as a general rule for kitchen island lighting, you should aim for about 30-36 inches above the counter, that's about eye-height. We've talked about Lumens affecting the brightness lights, but the colour temperature of the bulb is just as important to the mood of a room. If you're going for a bright white colour scheme, you should aim for about 3000 Kelvin, but warmer colour schemes can suit a softer colour temperature, of around 2700k, or below. With our lights we advise a warmer vintage style bulb, but with our more modern designs such as the Cordero, a G4 daylight bulb is a more suitable choice. See our bulb options here. 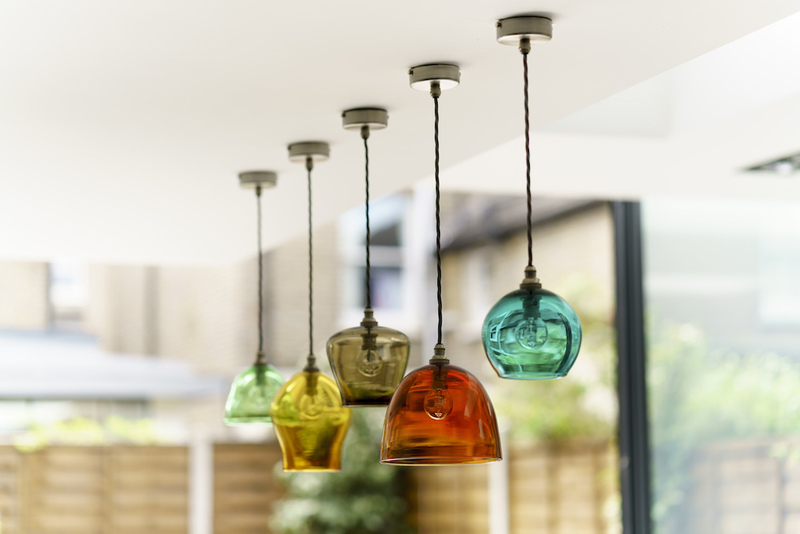 Pictured: A selection of lights from our Classic Pendant Range in Emerald, Yellow Ochre, Mocha, Garnet Red, and Teal. 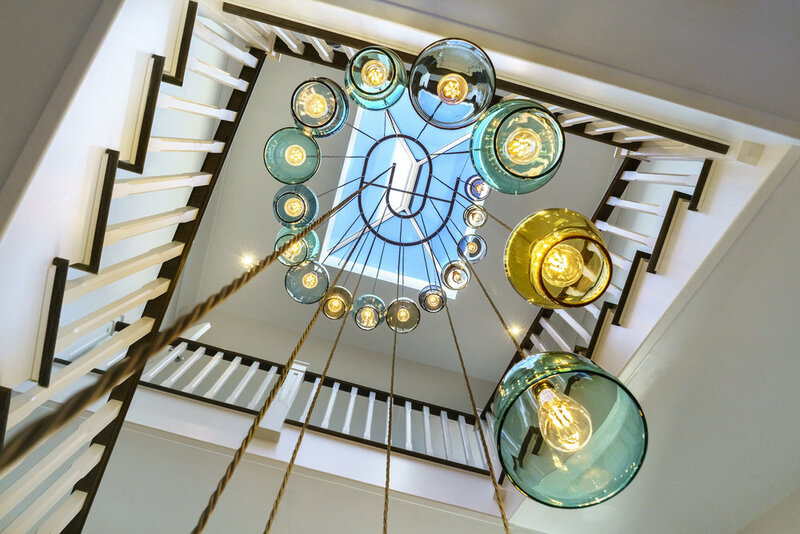 If you'd like to see more of our lighting projects, take a look at our projects page or gallery, or click here to contact us. The crocuses, hyacinths and bluebells are starting to come into bloom in their beautiful shades of purple and indigo. A highly versatile colour, purple can sometimes be overlooked in favour of classic blue and neutral hues, but purple makes a stunning accent colour, and with Pantone’s colour of 2018 being ultra violet, we’re seeing designers inspired to use it more and more. Here are some examples of the ways in which we've used purple, and succeeded in bringing out the beauty of this colour. Above: Triptych Stem in Teal, Indigo and Citron. With Teal and Citron both on the edge of green in the colour spectrum, the addition of Indigo balances out the combination effortlessly. A Pear Drop Chandelier in this elegant living room holds pendant lights in Aubergine, Slate Grey and Smoked Olive. The designer has kept the colours in this room neutral, with dusky lilacs and pale olive green walls allowing the Aubergine to stand out, adding a touch of sophistication. The bold combination of red and purple creates a daring partnership with these Caravaggio pendants. Both colours have regal connotations and can create a striking look. The vivacity of the two can sometimes be overpowering, but the muted dark blue backdrop and subtler Aubergine pendant break the tension between the brighter Purple and Garnet Red shades. The combination of purple and yellow is frequently found in nature, appearing in flowers like irises and pansies, so it's not a surprise that these two are named as 'complimentary colours'. This room gives plenty of breathing space to this palette, with its white walls allowing the purple and yellow pendant lights to stand out. Pictured here: a Canary Acid Drop, and an Indigo and Slate Grey Round. Bedcover by Bluebell Gray. This year sees the 40th Anniversary of Decorex International and to mark the occasion three leading Derbyshire brands will celebrate the excellence and creative heritage of the county by collaborating to curate the main exhibition entrance café. Innovative designers and artisans Blackpop, Curiousa & Curiousa and Royal Crown Derby not only share their Derbyshire base, but a passion for design, British manufacturing and the celebration of colour. The Derbyshire Collective Café will provide a sumptuous, eclectic and dramatic entrance to the Syon Park location. Blackpop, who produce wallpapers and fabrics that 'punk up the past’, are creating bespoke table dressings mixing their trademark anarchic wallpaper patterns with a mix of surface pattern designs in the form of plate shapes from fine bone china manufacturer, Royal Crown Derby. 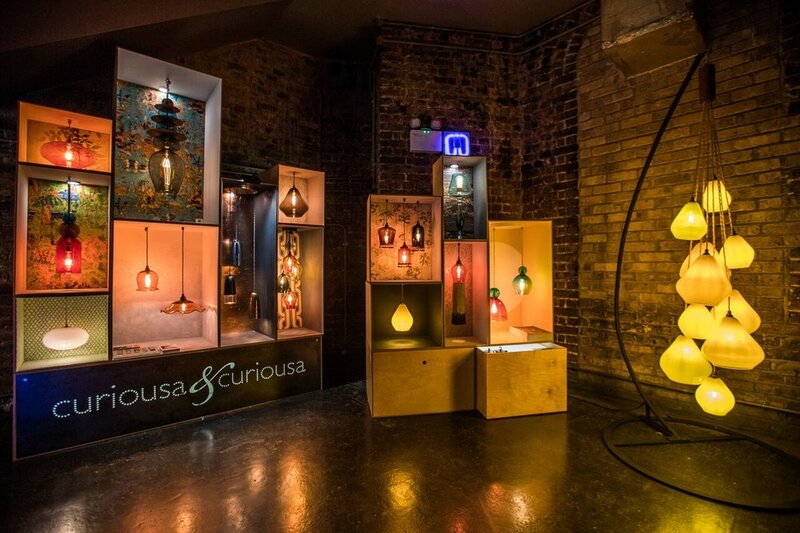 Curiousa & Curiousa, renowned for their hand-blown glass lighting with colour at the heart of their appeal, will produce a series of playful stacked light chandeliers fusing glass shades with Royal Crown Derby’s fine bone china tableware to give an artistic and modern twist. Royal Crown Derby’s Sales and Marketing Director, Steve Rowley, said: “We’re honoured to have been asked by Decorex to take part in the 40 year celebrations and have the opportunity of styling alongside fellow local brands, Curiousa & Curiousa and Blackpop main entrance café to be known as The Derbyshire Collective. It clearly showcases the high quality craftsmanship originating from the Derbyshire region. Design Director, Maxine Hall of Blackpop said, “Blackpop are excited to be collaborating again with our Derbyshire neighbours Curiousa & Curiousa and Royal Crown Derby - what a creatives dream! Our sumptuous wallpaper and fabric designs will be in their element, entwined with hand decorated fine bone china and colourful hand blown glass pendants, celebrating in style Decorex's 40th anniversary”. Together, this Derbyshire Collective aim to establish an opulent yet outré aesthetic, championing innovative Midlands design, in celebration of Decorex’s landmark year. influences. Creating a striking yet elegant light that injects an intoxicating blend of luxury, colour and decadence. Curiousa & Curiousa’s designer Esther Patterson commented ‘The tassel lights evoke a bygone age of opulence from the daring 1920’s and the influences at that time from the British travelers who brought back rich and luscious textiles and objects from the far reaches of our planet. As a nation we embraced these influences and a special style emerged from this. But to bring this piece up to to date we’ve mixed a contemporary Copper, rich Aubergine, Smoked Olive and Yellow Ochre. Also launching at Decorex is the 'Lotus Dine’. Individually free-blown and hand-crafted to order, 'Lotus Dine' features three pieces of hand-blown glass, suspended beneath a bespoke, half metre disk of walnut wood, and their new table lamp; ‘ The Tulip’. This elegant stemmed light was inspired by both masculine and feminine design influences, fusing solid lines with a softer silhouette to create a striking lamp that gives a nod to mid Century modern design. Sometimes you need somone else to write your story to realise just how amazing it's been. Pendle Harte spent an afternoon with Esther in our Islington showroom and wrote a wonderful piece for Absolutley London. We're opening our doors once more at this year's Wirksworth Festival. Not only can you see all our latest designs, but we will also have or once-a-year only offer of up to 50% discount on all our seconds in stock! Now entering our second year here at Haarlem Mill, this is a great chance to explore this historic building as well as browsing our shelves to see how we can help light up your home. The bedroom is the perfect place to change how you think about paint. Rather than selecting one pale wall shade as a backdrop and planning a scheme from there, try to choose your paint colours as part of the whole palette. For example, you could take your colour cue from your linen, bed frame or a statement chair, then choose complementary or contrasting shades for your walls. 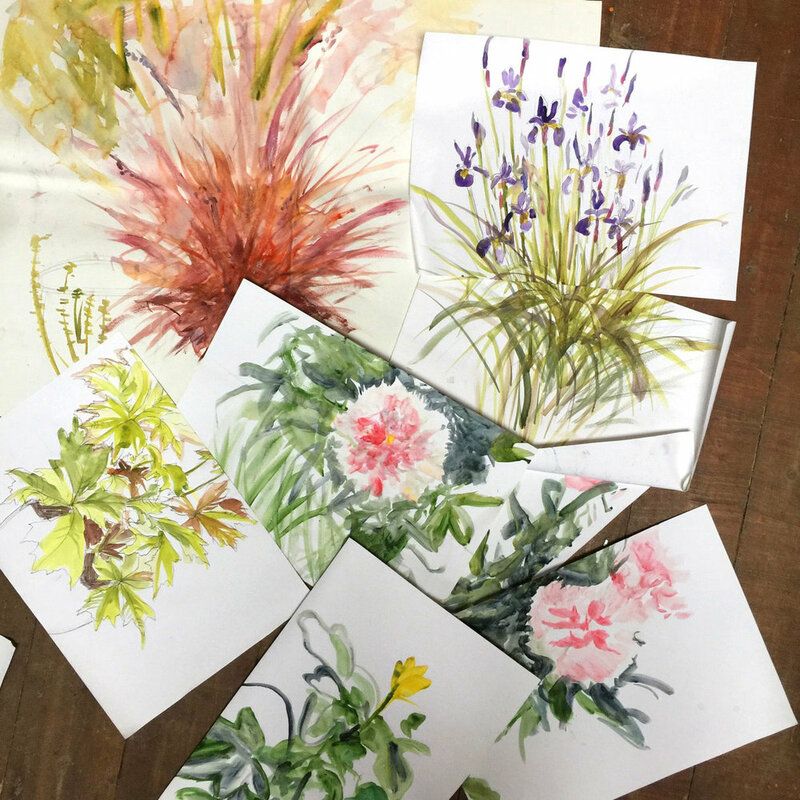 Paint isn’t limited to walls either, so think about continuing colours onto furniture or painting your floorboards. 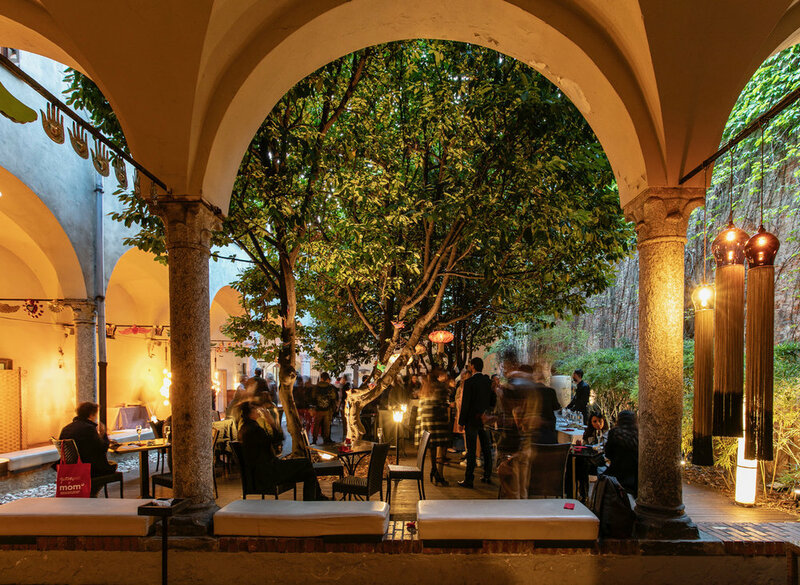 While the primary function of lighting is to illuminate, it can be more than that, adding a layer of colour to any space. Once you’ve worked out where you need lighting and what type (try to include a mix of table lamps, wall lights and pendants), you can start to experiment with different designs. Coloured glass shades are a big trend, especially when combined with visible filament bulbs, while lamp bases in rich jewel tones look effortlessly elegant. If you’ve fallen in love with a piece of art that’s destined for your bedroom, it can work well as a starting point for a colour scheme. However, when an artwork’s primary function is introducing colour, choose it after most of the major elements to ensure it doesn’t dominate the room. By doing it this way, you can layer colours, or use it to balance bold shades by providing a moment of calm. Be sure to pick a theme that won’t clash – for example, a coastal picture may look out of place in a bedroom filled with exotic décor even if the colours are complementary. 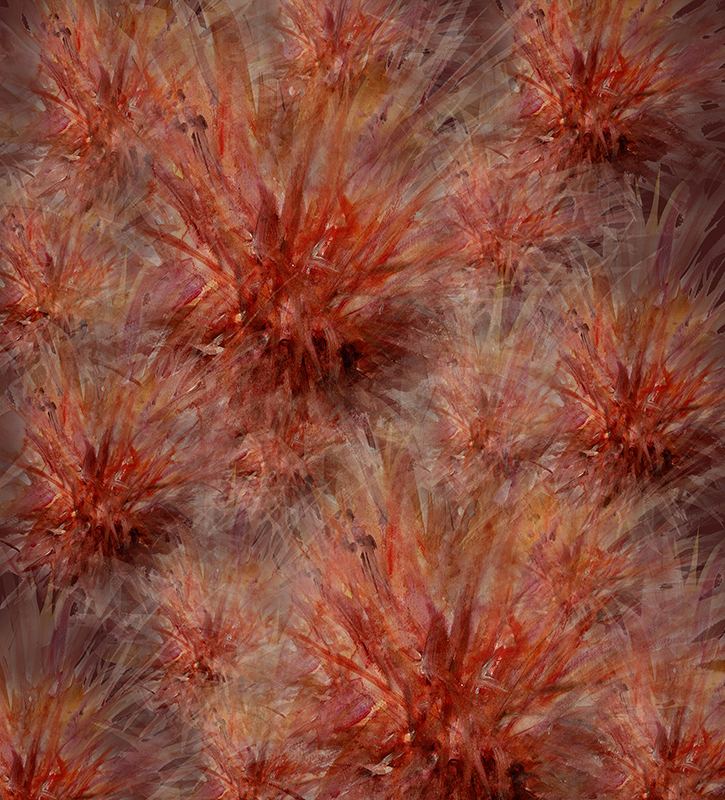 Small decorative touches can have a big impact and none more so than flowers. A fresh floral arrangement is a real treat, so display them in a vessel that reflects the style and colour of your scheme. Placed prominently on a bedside table or windowsill, flowers are an easy way to add changing colour with the seasons or enhance the feel of your bedroom, whether that’s a vibrant space or a relaxing sanctuary. Thanks to everyone who visited us at Icon House of Culture at the Fabric building last week at CDW2017. We had a great three days, made over 150 new contacts, launched three new lights and enjoyed some fantastic food and drink!